[Giveaway details at the bottom of this post] It is no secret that Duc and I really like eating at solita Tacos & Margaritas at Bella Terra in Huntington Beach. It's just a tad too easy since he just lives up the street from the restaurant; when in doubt, we go to solita if we aren't planning on cooking. I'm sure this is the same case for those who luckily live above the establishment and the other neat places at Bella Terra. 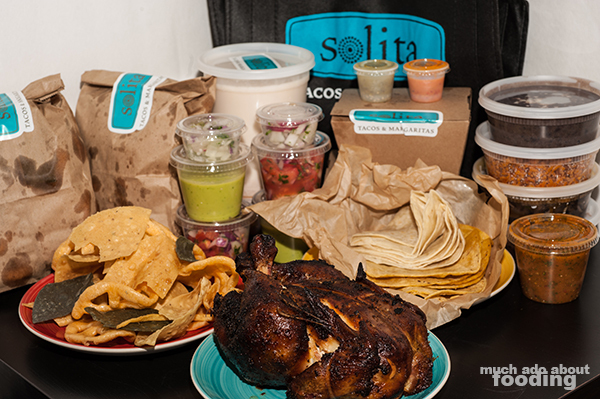 When solita unveiled that they would be offering to-go as well, it made it even harder to resist them. 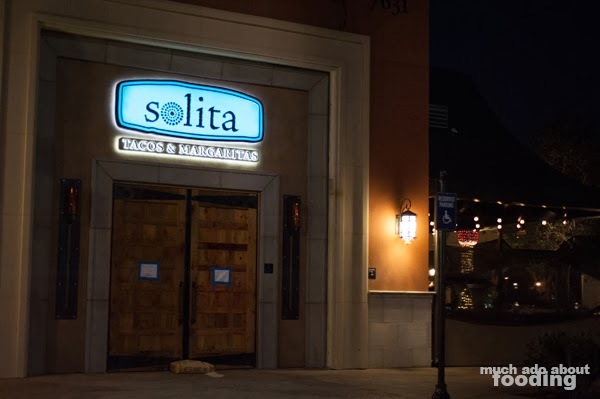 If you haven't heard of solita, it's by the same people who brought SOL Cocina to Newport Beach but this location is more casual and inspired by Baja street fare (read more from our past post here). The food is great and the atmosphere like a friendly neighborhood favorite. The takeout service just makes it even easier to expand the restaurant's reach and bring the party to others elsewhere. We were invited to try out their take-out just to see what new things they had in store. So just about everything on their regular menu is up for grabs on the take-out menu (available here) except for the cocktails, though you can purchase some margarita mix to go. In the interest of trying dishes out that we haven't had before, we opted for the larger order that could be for we two hungry people or sized up for a party. The ordering process was quite simple once I got the menu in front of me. A quick phone call once I got off of work to their take-out service line gave me the option of choosing when I wanted the food to be ready, and toward solita I went. When I arrived at Bella Terra where solita is located, I didn't have to worry about waiting in line by the host stand because there was a side window where take-out orders are handled. Sweet. It actually makes complete sense for them to offer take-out once you think about it - they're trying to offer street-style food so why not pick up your order from the street? Large orders come in the stylish black and teal solita canvas tote bag so you can carry everything out without worrying about food dropping out from the bottom of your bags. The service at the window was thorough, confirming everything with me and making sure to separate the wet, dry, cold, and hot components so they wouldn't mess with each other. I was a big fan of that! The options that vary from the regular menu include a la carte and Party Pickup options. 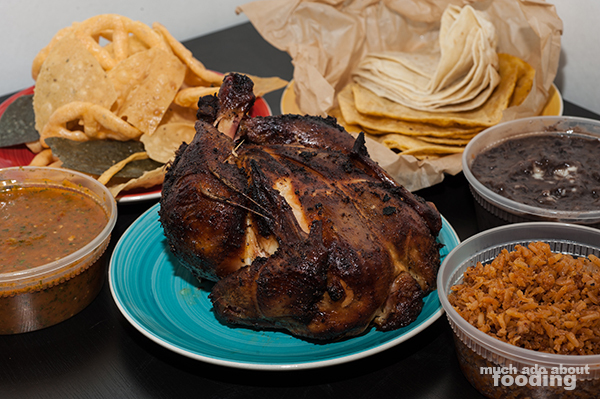 We were eager for the a la carte Whole Oak-Roasted Chipotle Chicken and "Build Your Own Taco" packages. Each of these came with their own package of sides, sauces, and other fixings. The chicken came with two 8 oz sides (we chose black beans and Mexican rice), 6 tortillas, 32 chips, and 8 oz of table salsa for just $21. We loved how smoky it was and still moist, a beautiful bird with plenty of accompaniments. This order takes a minimum of 30 minutes to prepare so it might be a good candidate for ordering ahead. We also took advantage of the Build Your Own Taco set which comes with a 1/2 pound order of the protein of choice, 4 oz taquero salsa, 4 oz salsa fresca, 2 oz onions, and 6 corn tortillas. 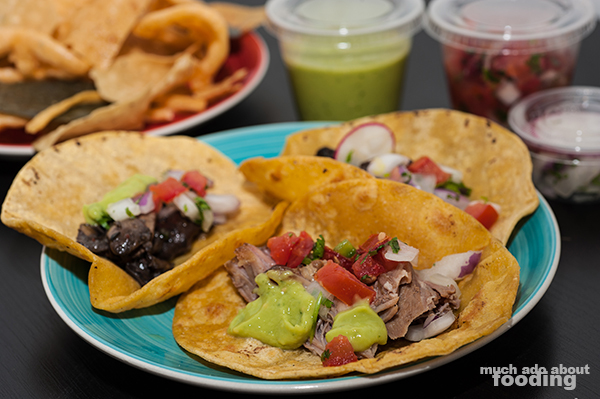 Our choices were the Carnitas ($11) and Mushrooms with Garlic ($16), both of which were just juicy and deceiving in size. At first, the containers they came in looked puny but then we started eating and realizing we really could not finish off the feast. We washed everything down with our order of 32 oz of Horchata ($8) which can also be switched out for Chia Limonada or Agua Fresca. Their take-out service is open Sunday through Thursday from 11AM to 10PM and on Friday and Saturday from 11AM to 11PM. Check out the take-out menu here and pick up your order at solita (7631 Edinger Avenue, Suite 1508, Huntington Beach, CA). As an opportunity to try out their service, solita has generously allowed me the opportunity to give one of my readers a $50 giftcard for their take-out service (used in one visit). Enter below! The giveaway will run until 7/28/14 at 11:59pm PST. Winner will be contacted upon winning and has 48 hours to respond before another winner is drawn.